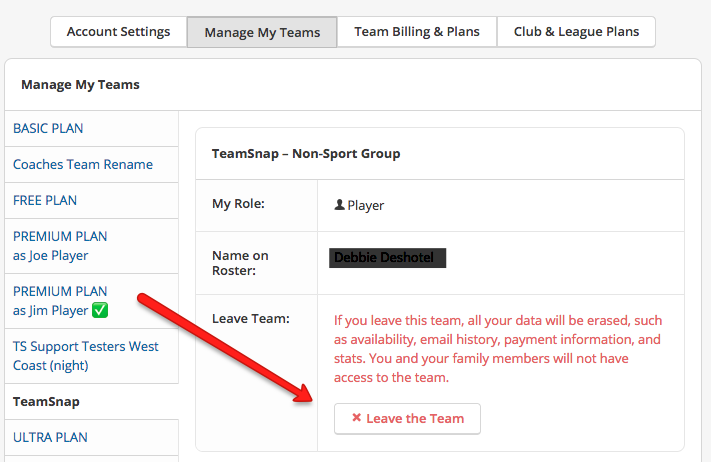 TeamSnap allows you to leave a team if you are a primary contact and as long as you don’t own it. This action will remove you from the team's roster and will remove your access to the team and remove the member profile from the roster. To regain access to the team you will need to be re-added and invited by a team manager. 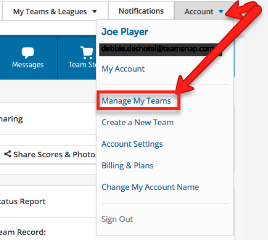 Tip: If you do not see the team listed under Manage My Teams this means that you are a roster contact. Follow the steps below to remove yourself from the team as a contact. If the team you want to be removed from does not appear under the Account screen when you follow the instructions above, then you are likely listed as a secondary contact under a roster member for that team. Following the steps below will remove you as a contact under the roster profile you were listed on, and you will lose access to the team. To regain access at any time you will need to be re-added and invited by the roster member or a team manager. This action will remove you as a contact under the roster profile you were listed on and you will lose access to the team. To regain access at any time you will need to be re-added and invited by the roster member or a team manager.